How to get access to the virtual machine hard disks when the virtual machine is turned off? Right-click on the Parallels Desktop icon in the Dock > Click Control Center (virtual machine list in Parallels Desktop 9 and earlier). Right-click the virtual machine you would like to access > Show in Finder. In the Finder: Right-click the virtual machine .pvm file > Open with > Parallels Mounter. 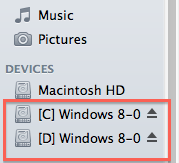 Virtual machine hard disks will appear in the Finder Sidebar as external drives. Note: before running the virtual machine you need to eject virtual machine hard disks from Finder.